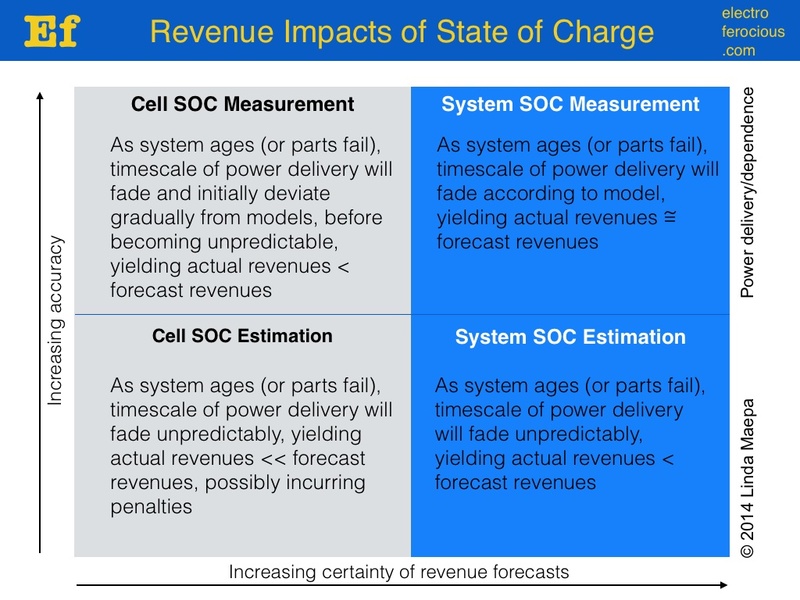 Last time, we considered the impact of battery SOC (state of charge) technology on the ability to provide reliable and actionable data for modeling future energy revenues from a battery system. On the power axis, the same revenue and risk concerns must be considered. While there are cost impacts for both as well, those topics will be addressed in future posts. If we look at ancillary services, the first thing that comes to mind is FERC Order 775 and its creation of a mechanism to value accuracy and speed of response to a regulation signal. (See the positive pricing impacts of the Order in this 2013 Greentech Media article for energy storage ancillary service providers in the PJM market.) The method used to determine battery system state of charge affects the financial modeling for this particular value stream, especially if the method the technology used is estimation. When estimating SOC, there is a divergence between battery system actual SOC and the reported SOC. This divergence represents a small delta that grows larger with time, sometimes in a discontinuous fashion. Accuracy and response performance will fade as the reported SOC does not reflect the actual on-board energy capacity (up or down) required to provide the ancillary service. The rate at which this performance fade occurs is a function of how a battery system is designed to respond to the effects of battery system aging (caused by time in service, how the battery system is operated, and the environmental conditions of operation), a fruitful topic for another post. Financial models of #battery system revenues for power applications are sensitive to SOC technology…. 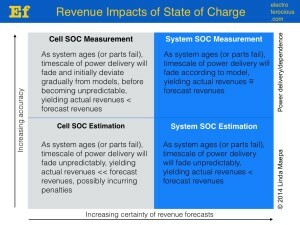 The impacts of battery state-of-charge implementation to power revenue modeling. Feedback on this chart is welcome.